Here’s the post where I tell you about the *aha* moment I had a few years ago when I figured out how to sew around curves. At one point I almost gave up and thought I better just stick to straight lines. I mean, you can do SO much with straight lines (blankets, quilts, bags, curtains, cushions, and a bunch of other things from the early days of this blog). But once I figured out how to sew nice curves, there was no going back. I started off making cupcake pincushions, then putting curves at the top of my bags, adding curves to the bottom of bags, and making round seat cushions. All this because of one little trick. It helped me tremendously and I hope it helps some of you, too. First off, let me show you how I used to sew. While sewing a straight line, I always focussed my attention on where the fabric was in relation to the 1/2″ line on the stitch plate. My eyes always went to where the arrow is, making sure the fabric was feeding correctly. Then, when I was sewing curves, my eyes went to the same spot. This was bad. Very, very bad. Where the curve hits the line is the key. In the picture below, the curve meets the line too far toward the front of the stitch plate. 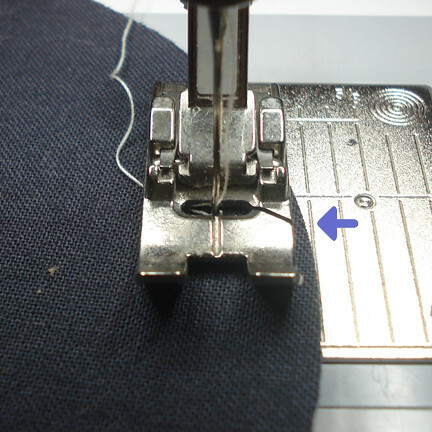 The arrow below shows where the fabric should meet the line. Below, the circle doesn’t even touch the line until farther back on the stitch plate. This is how it’s supposed to be. Nice, eh? And just for review, I’ve taken off the presser foot so we can all see clearly what is going on here. This is BAD. Just a simple little tip for sewing around those curves. Now go sew something round and let me know how it goes! While I appreciate the great and clear pictures, I must confess I don’t understand. Exactly WHAT is ‘bad’ and what are you showing us that is ‘good’ ? I can see that in the ‘bad’ pic without the presser foot the thread is laying in a different position than in the ‘good’ pic, but I must be missing something – everything else looks just the same! I feel like a real dunce not being able to see the difference, especially since you’ve provided such clear pictures. It’s all about where the fabric hits the line on the stitch plate. In the bad pictures, the circle isn’t in the right place. It hits the line too far toward the front of the stitch plate. In the good picture, it hits the line exactly to the right of the needle. Ignore the thread – it doesn’t mean anything. Please let me know if this still doesn’t make sense. I’ve been putting off posting it because I knew it would be hard to explain. I’m happy to try explaining it again. I had the same reaction and I understood the point. The photos are confusing. Aha!! After reading the other commenter and your reply it really clicked! I must admit too that I read the post several times (because I’ve struggled with this same technique! ), and I wasn’t getting it. However, you’ve done a great job explaining it…I think it’s just a difficult thing to write out. Your reply explanation did it for me! Love your blog…have been following for years but never commented but had to on this one:) Thanks for all you share with us! This is a great tip and a hard lesson learned – I had the very same “ah-hah!” moment after struggling with curves when starting to sew. Thank you! This is great information! I learning to sew totally from the internet and you are such a super teacher! Awww, thanks! There is so much great information online – I’m sure you’ll learn quickly! Thanks for your kinds words, Sarah! Frustration is bad. I hope this helps! Great tutorial I needed the clarification. Great tips! I also find it a bit easier to sew curves if I shorten my stitch length a click or two. I find it a little easier to stay on track. Thanks for the tip. I’ll have to try sewing a curve again. Thanks for the tip and the clarification. I could see when the fabric touched the line on the throat plate was wrong, but knowing what the landmark to look for was, it all made sense. I think I need to slow down a bit, too. So glad it made sense! I sew around curves pretty slowly. Fast is okay, but I can’t get it perfect unless I slow down. Ah! Now I know where I’ve been going wrong, i love the internet 🙂 thank you for posting this. I kind of understand where you might be coming from with how to follow the line but I’m interested in how you would ‘feed’ the material. With a straight line it’s a straightforward (no pun intended) method of just pushing the fabric through and keeping it straight but how do you ‘feed’ the fabric and follow the curve on a differently shaped bit of material? In short, I have a vague idea of where to focus but no idea of how to push. Also I can see this being harder with a larger piece of material – any tips on that? With sewing something like a circle, my left hand is doing most of the guiding and it’s not even really guiding. I find that as I’m going around curves, it’s easiest if I can find the pivot point on the circle and hold that still while the fabric curves around the pivot point. Does that make sense? I just stumpled over your blog and I must say I am learning somethings I had questions about. When sewing curves, I do it the wrong way. So I am going to practice the way you showed it here. 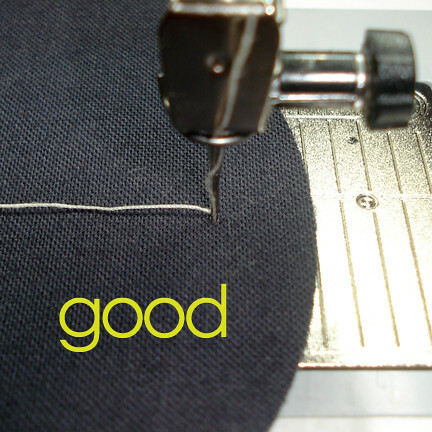 thank you sew much for sharing with us on how you do things, it really helps. OK, I read & re-read & did NOT get this until I tried it on my own machine. 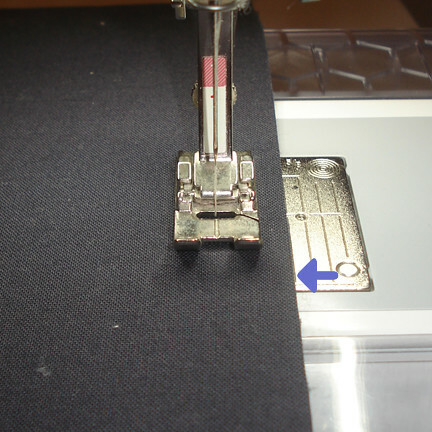 Even though I didn’t really believe it would make any difference, I chose a POINT on my sewing machine to use as a guide instead of using the regular guide line. IT MADE A HUGE DIFFERENCE! A small thing, but makes curved seams soooooo pretty! Thanks, craftapple, for sticking with us & explaining until it made sense. I’m so glad this worked for you! It’s an easy thing once you get the hang of it and it takes the fear out of curves! Thanks for taking the time to comment and let me know! Oh thank you thank you thank you!!!! I’ve only just begun sewing and curves were really difficult…and I am attempting to make dolls for my daughters christmas presents so there are a lot of curves involved. At first I couldn’t figure the difference between the two pics but then it clicked into place! I wasn’t even looking for sewing tutorials either…I found your mod podged floor mat (something I need to make for the girls room to cover the tin of paint they tipped over lol) and my eye caught this post. Thank you for the tip. 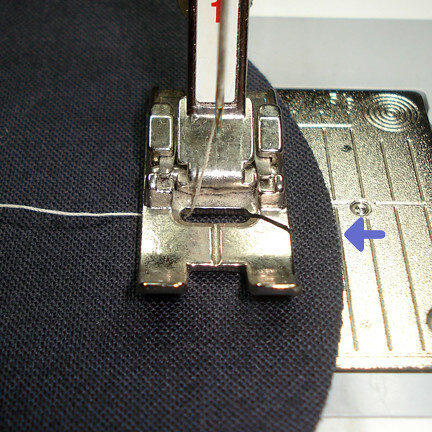 I’m a beginner and have a question: with straightline sewing the machine pushes the fabric to move up; when you do curve (or anything other than straightline), do you have to cover that mechanism so that doesn’t touch the fabric? Ah ha. Great observation! Just like looking at the baseball pitch all the way until it hits your bat. Where you look is where you’re guiding the fabric to. 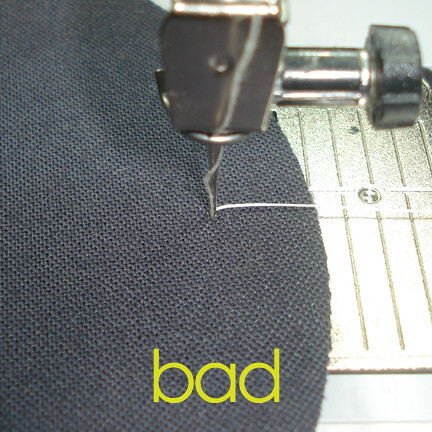 Aligning where the needle is to where the outermost curve of the fabric makes sense! Looking forward to trying it! Thanks, Linda! I tried it, and it helped a lot. Thank you for sharing. Hi Linda, I need help sewing a bear skin rug…lots of curves, long hair and thick skin, plus I need two layers of felt ruffles……any suggestions on how to get it all put together. Hi, I have been given a new machine for christmas and its meant to be an all singing dancing – but i’m struggling with just a basic curve as in my machine wont let me move the fabric round whilst sewing……its hell bent on just doing straight lines…… I know this isn’t what you are advising on……… but do you think you would know why? I can’t think for the life of me what i’m doing wrong!!! oh thank you thank you AAAAHHHH, I have been having trouble getting a nice curve for the sole of slippers. Will practice this on circles and then give it a go. Another way of saying what your pictures show is the fabric should meet the half inch guide mark where the needle is, about halfway between the front and back ends of the plate, not at the front of the plate. Is this right? How about if your trying to sew a curve using zigzag stitches? Won’t they bunch up, I too am a dunce with curves. I will try just regular straight stitching first around circles and you will probably hear me yelling from my house to yours,I get so frustrated and if you could do a utube video it would help all of us understand it more. 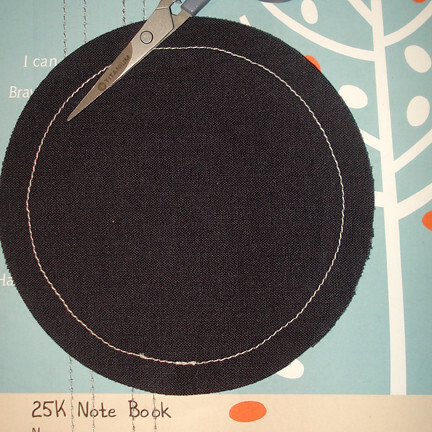 I need to sew a circle onto a shirt for a project I am sewing. Would I use the steps here, or is it something completely different? perfect race car but the 356 just was not powerful enough to be competitive. Thank you. Very clear and most useful. i always draw the circle, scallop, curve and follow that line exactly… then trim. always perfect. covered by state-of-the-art security measures like: CCTV Cameras, access control logs, controlled access cards, etc. He has worked and done consulting throughout the world, thus far accomplishing much more than many would hope to inn their entire lives.